VIDEO | Trump administration officials signaled as early as August their support for providing defensive lethal weapons to Ukraine. VOA recently visited one U.S. company in Texas that has been selling lethal weapons to Ukraine since last year. A U.S. company says it has been selling lethal weapons to Ukraine since last year, ahead of an expected decision by the Trump administration on whether to provide such weapons to Ukraine. "We started delivering our product to Ukraine last year and we are continuing deliveries up until now," said Richard Vandiver, Chief Operating Officer at the Texas company AirTronic, USA, in an interview with VOA's Ukrainian service. Vandiver said the sales have been limited to short-range defensive weapons, principally Precision Shoulder Fired Rocket launchers (PSRLs), which are a redesigned and updated version of the widely deployed Soviet RPG-7 anti-tank weapon. Ukraine is engaged in a struggle against Russian-trained and funded separatists in its eastern region and fears an armored assault. "The ability to stop armored vehicles is essential for Ukraine to protect itself," said General Joseph Dunford, chairman of the Joint Chiefs of Staff, during the testimony before the Senate Armed Services Committee on September 26. Vandiver told VOA the PSRL should be considered a defensive weapon because of its limited range. 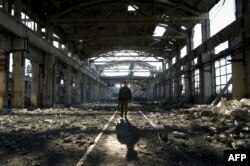 FILE - An Ukrainian serviceman walks through the rubble of a destroyed workshop after fighting with pro-Russian separatists in Avdiivka, Donetsk region, March 31, 2017. "Obviously, PSRL is a lethal system, but it's a defensive lethal system," Vandiver said. "The RPG-7 has the effective range of under a thousand meters. "As long as the weapon system stays [in government-controlled territory], it's not an offensive weapon, but if armor starts to cross the river than I would assume that the Ukrainian defense forces would employ our systems to stop the armor." The U.S. Congress has approved $350 million in security aid for Ukraine in its most recent National Defense Authorization Act (NDAA), including $47 million for defensive lethal weapons. The act awaits final approval in the House of Representatives before going to President Donald Trump for his signature. 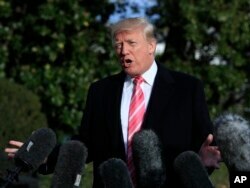 FILE - President Donald Trump, speaking to reporters before leaving the White House, Nov. 21, 2017, for the Thanksgiving holiday, is reported to be considering a recommendation to provide lethal weaponry to Ukraine. Trump is reported to be considering a recommendation received from his National Security Council this week to provide lethal weaponry to Ukraine. The weapon considered most likely to be included is the shoulder-fired Javelin anti-tank missile, which features a sophisticated self-guidance system and a range more than four times greater than the PSRL. Any sales of lethal weaponry to Ukraine marks a reversal of a non-binding policy implemented under the administration of former president Barack Obama. "In the formal sense, there is no embargo on Ukraine, but you could say that there is a de facto embargo," said Michael Carpenter, senior director of the Biden Center for Diplomacy and Global Engagement at the University of Pennsylvania. "Formally speaking, [Obama] did not make a decision on sending weapons to Ukraine, so de facto that became an embargo." Any such U.S. military sales must be licensed by the State Department's Directorate of Defense Trade Controls, which says it is restricted under federal regulations from commenting on commercial sales export licensing activity. However, the department issues a list of defense articles and services that have been authorized as direct commercial sales each year. The most recent list shows that more than $26.9 million in military sales to Ukraine were authorized in 2016, with more than $17.6 million of that having been shipped. More than $5 million of the authorized sales comprised lethal weaponry, mainly comprising firearms and ammunition. The report does not show how much of that was actually shipped. Vandiver declined to discuss exact details of the AirTronic supply contract with Ukraine, but he emphasized that the activities are conducted in "very close coordination with the U.S. Embassy, with the U.S. State Department, with the U.S. Pentagon and with the Ukrainian government." "It took quite a bit for us to secure authorizations that we needed, because of the sensitivity of the issue under Minsk II," Vandiver said, adding that the lethal system is not banned by the agreement. The Minsk II agreement — brokered by Germany and France in negotiations with Russian President Vladimir Putin and Ukraine's President Petro Poroshenko in February of 2015 — was aimed at limiting the fighting in the East of Ukraine, but has had only limited success. "We are very familiar with the accords that were reached in Europe under the treaties … and we abide by those," he said. He added that AirTronic obtained an export license for the sale, "following the same application process as any defense contractor would follow." The Ukrainian government hopes to expand its purchases of lethal weapons from the U.S. substantially, and attaches great hope to the possibility that the White House will approve financial assistance for those purchases. The $47 million in possible lethal aid for Ukraine included in the NDAA would allow Kyiv to obtain more powerful defensive weapons, Ukraine's Ambassador to the U.S. Valery Chaly told VOA. "We hope that the bill [NDAA], which has been already approved by Congress, will be signed by President Trump. This would allow to unlock about $50 million in lethal defense assistance for Ukraine. The decision is with the U.S. president and then we will be talking about more powerful weapons," Chaly said. 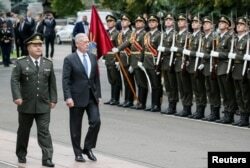 FILE - U.S. Secretary of Defense James Mattis and Ukraine's Defense Minister Stepan Poltorak walk past honor guards during a welcoming ceremony in Kyiv, Ukraine, Aug. 24, 2017. During his visit to Ukraine in August this year, U.S. Secretary of Defense Jim Mattis rejected any suggestion that the provision of such weapons may be considered provocative by Russia. "Defensive weapons are not provocative unless you are an aggressor, and clearly Ukraine is not an aggressor since it is their own territory where the fighting is happening," Mattis said. Still, some analysts doubt that the Trump administration is willing to abandon the self-imposed restriction on lethal arms sales to Ukraine. "I remain a pessimist on this," said Carpenter, director of the Biden Center at the University of Pennsylvania. However, he said, "I've long supported providing defensive arms to Ukraine. I think this is the right thing to do. It's the moral thing to do and also the strategic thing to do for the United States, because it would deter further Russia aggression."